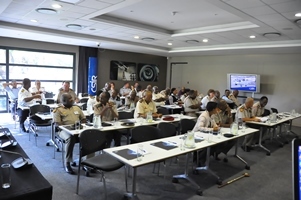 A group currently in the process of completing the Security and Defence Studies Programme offered by South African National Defence College recently visited the CSIR. The group toured various CSIR facilities and was introduced to capabilities and research areas on defence and security. The South African National Defence College is the highest institute of learning in the national security and civil service environments. It aims to improve cooperation and effectiveness between clusters of government departments involved in improving the quality of life for South Africans. The Security Defence Studies Programme, previously knows as the Executive National Security Programme, is intended to inspire and instil critical strategic thinking amongst potential future leaders within the defence force and defence industry. The candidates are exposed to thought leaders on strategy and national security. The tour of the CSIR facilities included the medium-speed wind tunnel which is one of the best-equipped and most sophisticated tunnels of its kind in the southern hemisphere. Types of tests performed in the tunnel include captive trajectory, or store separation tests, high-angle-of-attack tests, dynamic testing capability, as well as aerodynamic damping tests. Some of the presentations included overviews of the CSIR’s landward sciences that focus on the effectiveness of the dismounted soldier, the CSIR’s role in Africa and its whole-of-government approach to solving environmental asset management issues.